Jessica delivered the most convenient car buying experience imaginable! She was informative, prompt, and responsive. The whole process was easy and I wound up with exactly the vehicle I wanted. My wife and I are wanting a fully loaded 7 series and Cody was able to answer all of my questions with ease. It has been many years since I was greeted with such professionalism on a car lot. I not only recommend BMW of Bakersfield but more specifically Cody. We could not be happier. Went into bmw for the first time and had an excellent experience. Cody my sales consultant really guided me through my first purchase. He showed me the options I had based on my wants and likes and also for my trade-in and financial situation. overall, I would definitely recommended BMW to anyone looking for a great customer-first atmosphere when purchasing a vehicle. Cody was such a great salesman. He made it so easy and fun to get a car. I had such a great experience and am driving my dream car now! Bmw of Bakersfield has always given me great customer service. It has become a little hard to get a complementary car wash with them tho. They used to be on it. Now their service side is coming down. Cody was great! He even brought the paperwork to my house to sign. He really went out of his way to work around my schedule. I’ve had several BMW’s. They are my favorite car. Cody was wonderful and I will always go to him to buy a new car. The dealership was clean and comfortable. I appreciate Cody’s knowledge. Cody had amazing customer service skills. It's so easy talking to him and he is so knowledgeable about the products that he sells without being confusing. Very trustworthy and caring. Amazing experience all around! Very pleased with my recent experience with BMW of Bakersfield. It all wouldn’t have happened if it weren’t for Paula and Cherif. Paula is an excellent saleswomen and would highly recommend. Paula was so great wrote on the internet and within minutes got an estimate on a BMW suv for my wife. You guys have the best staff to take care of customers and there needs. Start doing doing some research and I was really looking for a jaguar and after talking to the internet staff I'm pretty now stuck on a 340i bmw. Will have to bring my husband in.! I would definitely recommend BMW of Bakersfield. I had a overall great customer experience. The purchase process was streamlined. I felt treated like a priority. The service and help of Cody in looking for my first bmw was easy and it was what I was looking for. The attention and the way they worked with me was awesome and if you are looking into a bmw this is the place to go. I had a great shopping experience, no pressure just loved buying my new car. The staff (Paula) was amazing. Thank you again for making my car buying experience easy. I gave this company 5 stars for their great employees and vehicle selection. Cody helped me choose the right car for my family and I, and we couldn’t be more in love. With having multiple children the X5 was the car for us. Don’t forget that they also sell other used cars! Even if a BMW is not what you were looking for, go check out their used car lot! Very pleased with my experience. Make sure you ask for Cody Jarnagan. Cody is so incredibly trustworthy and kind. Very knowledgeable and will give you the best pricing he can! He is very easy to work with and truly works for you! It was great working with everyone! Everyone was polite and friendly! No one was pushy. We found exactly what we were looking for at a really good price. Everyone made the purchase quick and smooth! Cody is the best! Go see Cody for BMW's. He gives the best prices and is very family friendly. I repeat only go to Cody! Jessica and Paula gave excellent customer service. Everything was very smooth, Paula explained the vehicles very thoroughly and I loved the fact that they were not “pushy” whatsoever (that can be a huge turn off to me because I hate feeling rushed or forced into things). I would definitely recommend BMW to anyone I know. Thank you, again, Jessica and Paula; you guys are awesome! Best auto repair service defiantly would recommend taking your bmw there and the service rep Carolyn does an out standing job when it comes to communication and help best experience there ..
Go see Mohsen Vizari, he'll take care of you?? 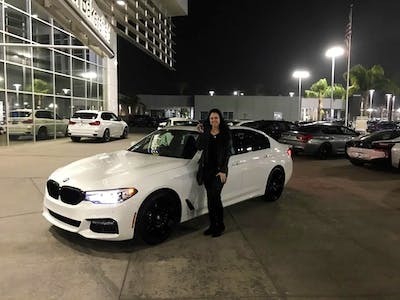 Elie was my salesman here and what a great experience I had it had to have taken 20 minutes from when I test drove the m2 to finalize the transaction. Never in my experience of buying cars has it been this easy. Also the delieveed the car almost a 2 hour drive to me. Amazing experience thank you to everyone involved at BMW. Elie it always helpful in everything I need on my visit to bmw, thank you so mucho great service elie . Just bought my first BMW and I am super satisfied with the whole process. Jorge Moreno was the best salesman who helped me find the perfect car with all my picky needs!! This dealership was excellent. I have no complaints, everyone was so nice especially Jorge Moreno. I would recommend everyone getting a car frol Jorge he will get you the perfect deal. Nice and clean. Nice people. Excellent array of cars to choose from and the salesmen are decent people too. They were flexible with negotations. Mazen was a reputable guy and extremely knowledgeable and helpful. Highly recommend this place.